Barge work fully insured to work over water – D&J Machinery And Rigging LLC. – Heavy Machinery Equipment, Moving, Hauling, Removals, Installation, Recovery & Transportation, Crane. D&J Machinery and Rigging specializes in barge work, and we are fully insured to work over water. Our customers are our partners, and we will work hard to understand and meet your unique needs. Because of the high-level of training and experience our staff has acquired, you can rest assured that your marine projects will be undertaken with highest professionalism. We take pride in our proven record of efficient, safe marine projects..
D&J Machinery and Rigging is also equipped for marine recovery work. Our expert team can meet the special challenges posed by marine recovery projects that require barge work. During a recovery, our team is cautious in salvaging critical equipment, and is trained to minimize expenses and losses. We will provide a competitive quote, with no hidden costs, giving you the security you business needs when planning a barge work project. As a contractor fully insured to work over water, we can give your business piece of mind during complex marine projects. 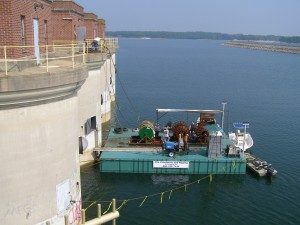 To see how our custom barge work solutions can be integrated into your operations, give one of our representatives a call today for a consultation.